BOD Incubator Ask for Price B.O.D. 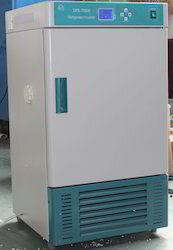 Incubator features double walled outer construction with mild steel epoxy coated paint finish. The other construction strengths of these systems comprising polished stainless steel based inner chamber with door operated illumination as well as removable 2 compartments in stainless steel finish. Also coming with removable adjustable shelving support as well as forced air circulation delivered quality motor blower also provides for optimum functional support.